The common “crucifix” orchids, such as Epidendrum ibaguense, are terrestrial species with reed-like stems and many aerial roots. They have long, thin stems and leathery leaves. The reed-stemmed species are propagated by removing pieces with aerial roots and growing them on, while the smaller species are divided. The flowers bloom in clusters, with up to 20 flowers open on a stem at once. They come in orange, red, mauve, purple, salmon and yellow. Plant in a bright position and water and feed well while actively growing and flowering. The majority of species in this genus are epiphytes and lithophytes. The epiphytes, often have much shorter stems than the epidendrums. The common name ‘crucifix orchid’ refers to the lip of the flower (called the labellum), which resembles a small, gold cross. Crucifix orchids are tough, easy to grow, easily propagated and have vivid, long lasting flowers. 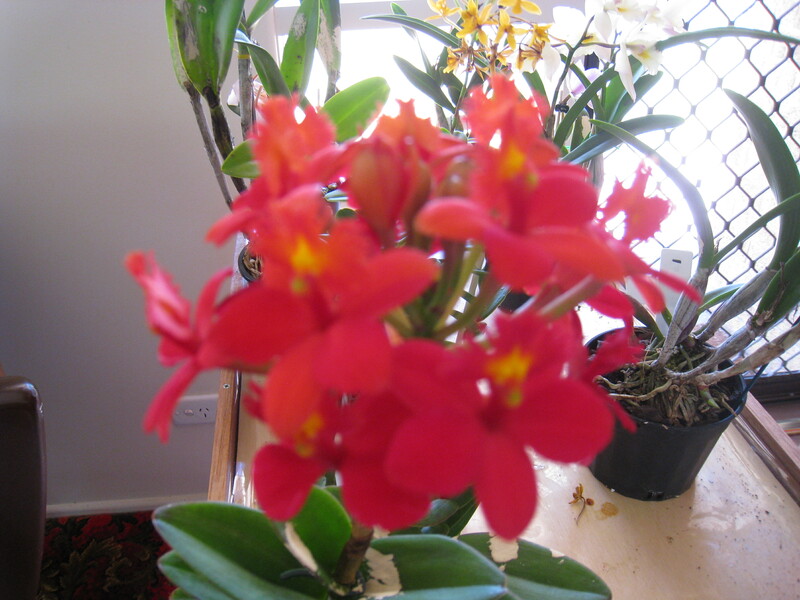 In fact, they are an excellent beginner’s orchid. They can be grown in containers in a free-draining mix, amongst rocks in the garden, or in soil. They like a frost-free climate and flower best in a full sun position. Publisher: Community Books, Darling Heights, Qld. Ruth Frost’s Pavlovas to Popcorn made me feel I had accompanied her on the voyage from Sydney to San Francisco in 1946. Her simple colloquial style of writing drew me within her circle of friends, embarrassing me whenever she defied authority, and admiring her for her sense of humour and kind heartedness. Ruth’s voice rings clear and true as she tells the story of her voyage on the SS David C. Shanks as a war bride. Her early life and her amnesia are related in a series of flashbacks, leaving the reader with a sense of bewilderment and mystery. It is not until much later that one discovers the cause of her loss of memory. The second part of Ruth’s book moves across the United States from San Francisco to South Dakota and on to Dumon, New Jersey, relating the hardships and happiness experienced by Ruth and Bill in their early married years, told in her own humorous style. Ruth writes lightly of her ‘monthly’ at the age of 13 when she thought she was ‘bleeding to death’, and the time she started smoking when she had been ‘covered in glass splinters’ while the ambulance attendants made her ‘sit in the gutter’ and picked them out. Her anecdote of Margaret, the German war bride, is harrowing. Margaret had been reported to the Gestapo for supposedly plotting some conspiracy. The results were devastating. Although a professional edit would have improved the book, Ruth Frost’s Pavlovas to Popcorn, with its recurring theme of courage and perseverance, is definitely an interesting read. It’s 1914. Troops mass for war in Europe, and even at a remote trading store in Transkei, South Africa, the Moss family and their sometimes-guest Richard feel the impact on their lives. Then Richard enlists, taking fifteen-year-old Fred with him. Albert and Martha are furious and afraid for Fred, but fourteen-year-old Eve is shattered, her hopes of eloping with Richard dashed. All she has to remember him by is a strange wooden mannikin … Chameleon was shortlisted for the Crime Writers Association Debut Dagger Award in the UK in 2010. Chameleon is a debut novel. Set in South Africa during the two World Wars, the author deftly weaves a story from intensive research, and gives an authentic feel to the characters and situations. Written in the style of Wilbur Smith, the author explains historical events crucial to the story with clarity and verve. The book grabs the reader from the start, and the pace quickens as the story enfolds. The stories of two families—one black and the other white—run parallel to each other, giving a sense of deep loyalties and hostilities held by each character. Chameleon has many twists and turns, which leave the reader guessing until the final chapters. I recommend the book to all those who love mystery, history and romance. Unique are the seasons of life. Their lengths vary; sometimes cut short; sometimes, painfully prolonged. How well I recall my Spring of life. A child of five, happy and free. Our ten-year-old brother towered above us, ready to fend off harm. The next, a year younger, laughed, pranced and sang. A source of joy. Then my sister. Two years and six months my senior, my dearest companion held a wealth of knowledge. I trusted they’d be near forever. Then bombs tore us from home and Japanese invaders ended the Spring of our lives. Summer was harsh. Our bodies scarcely grew in size except to swell and swell. Beriberi. But still we were together. My mother, my sisters and I stayed home. The days passed. Our strength ebbed away. We longed for food – and slept. My first taste of death. Rats fed on the dead – dead birds, dead animals, dead people. Disease spread; entered our home and stole my sister. Plague. My baby sister burned with fever; her body sprouted sores. No doctor. No medicine. For days and nights she burned. Smallpox. The eldest shivered and quivered even in the hell of summer. Drank the bitter herbs we picked – but couldn’t eat. Emaciated and exhausted, he sank down, his strength sapped. Malaria. Far off we heard – not harps of angels greeting us – but sounds of bagpipes on the plains. It lashed our bodies like a whip. We rose in answer to the call. Soldiers marched, kilts swayed, kettledrums flourished and pipers led the way. Hope and freedom followed in their wake. My brother rose, like a ghost, cured by a dose of mepacrine. Saved – we thought. Three years since the bagpipers played, God called the eldest to his grave. Years passed. Britain left and Burma bled. Anarchy raged. One by one we fled. I remained. Alone, but poised to leave. Finally, I stretched my wings and flew away; my studies incomplete. Torn asunder from kith and kin, what lay in wait, Down Under? I drank freedom and breathed joy. With open arms love beckoned. I nestled there; content. Now in the autumn of my years, I listen to the songs of birds, inhale the fragrance of a flower with my dearest friend and lover. Each day we watch the sun rise and set. It’s autumn. Will it last forever? Winter must come, but when it does, we’ll meet the future hand-in-hand as we depart this glorious land. In 1941, when Japanese planes bombed Rangoon, we evacuated to Mandalay in central Burma. Dad drove our maroon Chevrolet packed with trunks and suitcases, leaving behind our home, our servants, all our books and our toys. We were Eurasians, and Dad worked for the British government in the High Court. Now, four years later, we fled from the bombs that thundered down upon Mandalay and I was uprooted once more. The dilapidated sign with Burmese letters said we were passing the tiny village of Kankauk and would soon be at our uncle’s farm, some ten miles from the city. In the distance, the fierce sun blazed over a dozen wooden huts, huddled together like children in fear. My brother, Bertie and I sat at the back of the bullock cart with our feet dangling. The wind whirled the dust from the tracks onto our faces. As we trundled along, I turned, anxious about Mum. She gripped the sides of the dray. Her head swayed with each bump. My sister, Rose, was asleep and Herman, my crippled brother, who’d been born with infantile paralysis, grinned at the passing sights. I detected a disgusting odour and knew he had dirtied his pants. Bertie had to spoon-feed and clean him whenever he soiled himself but my older brother never betrayed any resentment or revulsion. We branched off from the track parallel to the Rangoon-Mandalay Road and rumbled down a trail dotted with thorny acacia trees on either side. The bushes had thorns as long as my finger – longer than any I’d ever seen. Cattle munched mouthfuls of leaves. I wondered how the barbs didn’t hurt them as they rolled out their tongues and drew the foliage into their jaws. Dad, who’d cycled ahead, was already there when the cart creaked to a stop. He pointed to a split-level hut not far off. The walls were of bamboo matting with layers of straw on the roof. The small kitchen and dining room had a bare earthen floor. The bathroom was also on the lower part with a large water pot in a corner and a wooden bathmat in the centre. Two bedrooms with timber floors on a higher level, kept the sleeping area free from damp. ‘Where’s the toilet Mummy?’ I asked, tired after being tossed around by the bumpy trail. I rushed to the little hut and looked in. A commode had been placed over a pit in which thousands of maggots squirmed. It stank. How I missed the clean white ceramic toilet bowl with the chain for flushing that we’d had in Rangoon. I daren’t complain, as my father had an aggressive nature and angered easily even when not drunk. I’d seen him trash Bertie and strike Mum and I remained incoherent in his presence. The farm consisted of several acres of flat, arable land. A hay-filled barn attracted flocks of birds that fed on grain missed in the threshing. Tiny minnows darted merrily in a small stream that laughed its way through the property. Further upstream was a Leper Asylum. ‘Keep away from the creek; lepers pollute the water. They swim in it,’ Dad said. Mum had always relied on our cook to serve up delicious meals. Brought up at a boarding school, she didn’t know even the rudiments of cooking, but later on, she learned how to make broth and fried rice. Dad’s sister lived with her husband and children in a cottage – a wooden structure with a metal roof and a verandah. On our arrival, we had dinner at their place. The next morning, I picked out the stones from broken rice grains in case they broke our teeth, and Mum made gruel for us. That afternoon it rained and I ran outdoors with a bucket to hunt for mushrooms. My cousin, Tina, was also collecting the edible fungi. She glared at me. The farm was theirs, but she didn’t tell me to stop, perhaps hoping that her stares were sufficient to frighten me away, so I continued gathering as much as I could. Mum sliced the mushrooms and fried them with rice for lunch. I swore they tasted like chicken but I hungered for something to read, and yearned to escape into my fantasy world again. I craved for a playmate, but my sister, June, had tragically died last year, and the books we had so enjoyed reading, remained on the shelves in Mandalay. If only I had one book or even a doll to keep me company! Once, Dad’s uncle gave us a bundle of clothes abandoned by refugees attempting the trek to India. They were tailored, suitable for a teenage girl. I imagined how lovely June would have looked in them. I’d outgrown most of my own frocks, but the dresses were too large for me as I was only nine. Fortunately, Mum had attended sewing classes at school. She picked out a white dress with blue spots and showed me how to alter it. The flared skirt and puffed sleeves hid my skinny body. Bertie had long outgrown his shorts and now wore native clothes – loongyis. The days trailed past. We ate wild bananas with round, black slippery seeds. Mum tried to set us a good example by attempting to eat the fruit but she gagged when she endeavoured to swallow them. At the time, we had a stray chocolate-coloured pup with white socks and brown, mournful eyes. We named him Rover. He remained with us, even though we were unable to feed him. It was a delight to have a pet once more, and I loved stroking his soft fur. Rover had to fend for himself but he joined us in all our adventures whenever he wasn’t away scavenging. One day, Bertie took me fishing and, to our delight, he caught a fish no bigger than his thumb. He held it between two skewers of bamboo and grilled it over the fire. Rover drooled and begged for a bite, but there wasn’t enough even for us. We sat by the stream and ate the manna from heaven. I couldn’t recall anything so tasty. When Dad had shot a deer at Kalaw, Nanny’s dried venison was yummy too, but eating toasted fish with Bertie on the banks of a stream with the wind singing through the trees and the clean whiff of hay drifting towards us was terrific. A few days later, Bertie remembered that the fish drank the same water the lepers bathed in further upstream. For months after, too afraid to tell anyone what we’d done, we checked our hands daily, in case the disease ate off the tips of our fingers. We became so desperate for food that Dad sold Mum’s beautiful silver fox fur wrap and the jewellery she’d inherited from her mother. People knew we were desperately short of money and offered rock bottom prices for them. I thought of my beloved books – of Gone with the Wind and the carpetbaggers who overcharged customers after the war. Each item of Mum’s treasures staved off starvation at irregular intervals, buying just enough food to keep us alive. When Dad sold Mum’s wedding ring to his relatives, they must have realised we were starving, and had no more to sell. One day, Dad’s uncle visited us. Before he left, he stepped up to my father and slipped a few dollars into his shirt pocket. My cheeks burned because we’d been reduced to such straits but tears came to my eyes when I thought of the food we could buy. That evening, Dad gave the money to Bertie and sent him to the grog shop to purchase bottles of spirit. In spite of having so little money for essentials, Dad insisted on having his daily nightcap – a glass of the native brew. Bertie had to go out every week and buy a bottle of liquer. What a waste when we were dying from lack of nourishment! I gnawed my nails. What if Bertie became a drunkard? I visualised him staggering home, stinking of booze with his shirt hanging outside his trousers like a tramp. Then he too would beat us up for no apparent reason, as Dad so often did. Fortunately, the experience had an opposite effect on my brother as he turned out to be a teetotaller. Dad escaped from any form of sickness, and his health appeared to be unaffected, whereas the rest of us were ravaged by illness. Little did I know that the war would have lasting effects, and start him on the road to alcoholism. Mum had twinges in the soles of her feet. She tried to conceal her sufferings but as the pain grew worse, she curled up in agony. Aunty suggested putting a block of camphor in cooking oil and placing it in the sun until it melted. I massaged Mum’s feet with the mixture, but my efforts only gave her temporary relief. She placed a fan made of palm leaves over her eyes to protect them from the sun’s bright reflection, and dozed off. On hot summer days, when prickly heat erupted on her back, she asked me to pierce the little bubbles. Then she fell into a deep slumber, her arms twitching. I lay beside her and slept from sheer exhaustion. Hunger made me tired, and sores developed on my elbows, forming ugly scabs. My eyes did strange things. When I picked out little stones and dirt from the rice before cooking, the grains appeared to meld into each other. Mum let out a sob and hugged me to her when I mentioned it. The sour odour of perspiration descended upon me. My ribs stuck out like a washboard and they hurt even from her gentle pressure, so I struggled to extricate myself from her bony embrace. I didn’t know then, but I was suffering from malnutrition and slow starvation. The days lingered on, and by the final spasm of the war, Mum had lost her voice and only spoke in a feeble tone. All sense of the flight of time vanished, and I dreamed of the past, losing all sense of the present. The moment my head touched the pillow, my mind dredged up memories of Rangoon. Falling into a broken sleep at nights, I frequently awoke to the sound of stray dogs howling. I shivered in dread and reached out for June, but soon realised she no longer lay beside me. The future seemed as empty as the long, lonely night. We’d always eaten polished rice because, in my parents’ view, only common villagers ate unpolished rice, but we switched to brown rice and soon liked the nutty flavour. Dad bought unbleached flour and cooked chapattis. We watched him as he kneaded the dough, pressed it flat with a rolling pin and swirled the round chapattis in his frying pan. They were scrumptious, but best of all, the swelling in our feet began to shrink. Once a week, Dad purchased an ox-tail from the butcher and made stew. I always had the smallest bones at the end of the tail and I bit off as much of the soft bone as I could until nothing remained. As the spectre of starvation edged closer, insatiable hunger gnawed at our stomachs and hunger-pangs kept us awake at nights. We dreamed of meat, and during the day spoke of it with reverence. Once when Dad was out for his daily walk, we heard a knock at the door. One of Dad’s cousins carried in a bag of sweet potatoes. Without a word, he made his way into the kitchen and placed it on our little table of stacked boxes. We thanked him, but he barely looked at us and left. I readily agreed but screwed up my face at the taste. Within a short time, our stomachs swelled. We remained weak and hungry. I thought of our life at Rangoon and yearned for those days. I replayed a film from the storehouse of my memories. I dreamed of devouring chocolate éclairs from the Continental Cafe, and craved for food. The memory only served to make me hungrier. We grew thinner and thinner. Only Rover appeared to thrive. Like most animals, his nose led him to food. He skulked around butchers’ shops and snatched a bone that Buddhists threw to the dogs. Chased by other mongrels, Rover raced home and chewed on his prize in the shade beneath the hut. I’d seen Cook make delicious broth from what Rover now gnawed upon and my mind conjured up the aroma of soup simmering on the stove. I imagined sucking the marrow and savouring its flavour as it oozed into my mouth. I licked my lips. Resourceful Bertie trained Rover to hand over his spoils. The dog waited patiently, flogging the ground with his tail while my brother cracked open the long bone and scraped out the contents. Then he returned it to Rover, gave some of the substance to me, and ate the rest. From then on, until Britain regained Mandalay the following year, Rover brought us a something whenever he could. As soon as the fighting in the city ceased, we moved back to Mandalay. Rover accompanied us. We went straight to the house Mum had inherited from her parents. The infamous Kempetai had occupied the place and left in a hurry, leaving behind a grand piano in the sitting room. It grinned at us like a skull I’d seen at a museum. Mum’s fingers strayed to the keys. ‘This can partly compensate for the one we lost at Rangoon during the evacuation,’ she said. My thoughts flew back to Mum’s piano and all my dolls and toys, but too excited to dwell on the past, I rushed towards the other rooms. In the bedroom, Bertie gazed at the dead body of a Japanese officer. I stopped and stared at the corpse. Mum pulled me back and hung on to me until Bertie had dragged the cadaver by its legs and left it in the gardens of Queen Alexandria’s Children’s Hospital, which stood behind our house. He kept the skull as a souvenir. The cranium displayed a fine set of teeth and gave me a toothy grin. It had a terrible stink, so I stayed away until no odour remained. The skull fascinated me, however, and I often returned to gaze at it and wonder where the departed soul now lived. The Japanese had used the building behind ours as a military hospital, and in the months of fighting around Mandalay, it had filled with casualties. Orderlies had laid their dead in rows, and hundreds of corpses lay awaiting cremation. In the hospital grounds too, cadavers piled up. Rover strayed from home and delved among the bodies. Dogs snarled and fought each other over the fly blown-corpses, and Rover raced back, carrying parts of the dead. He dropped the foul-smelling tribute at our feet and wagged his tail. We couldn’t tolerate the horrible stench and chased him off. Rover slunk into the shadows and never returned. Perhaps soldiers shot him during the clean-up of Mandalay or he fell ill from consuming rotting human flesh. We remained inconsolable over the loss of Rover, our companion in distress, until Dad received a letter from the High Court at Rangoon, advising him to report for duty. The government offered him a senior position and enclosed a cheque, but as accommodation was scarce in post-war Rangoon, they requested him not to take us with him. Before his departure for Rangoon, Dad authorised Bertie to collect his rations from the army canteen. He brought home tins of bully beef and sausages as well as tickets to the Garrison Theatre. Wide grins spread over our faces and our eyes sparkled when he left. Mum sprinkled a few drops of the eau de cologne on her handkerchief. She had hoarded a bottle during the war. The perfume lingered on in some subterranean cavern of my senses and I always associated the fragrance with her. A mantle of peace descended. The bombing had destroyed most of Mandalay, and in places, only the facades of buildings remained, so the theatre was nothing more than a Nissan hut. Bertie found me a seat close to the front and I clasped my trembling hands to my chest when the curtains were drawn. A soldier sang, You are my Sunshine. I forgot my surroundings. My pulse raced and thrills of excitement rippled down my spine. We were free. Free of the Japanese, free of Dad and free of hunger. Publisher: Tyndale Momentum an imprint of Tyndale House Publishers, Inc.
Embark on a chilling journey inside one of the world’s darkest and most dangerous places: Evin, the notorious Tehran prison. Here, prisoners are routinely tortured, abused, and violated. Executions are frequent and sudden. But for two women imprisoned for their Christian faith-Maryam Rostampour and Marziyeh Amirizadeh-this hell on earth was a place of unlikely grace as they reflected God’s love and compassion to their fellow prisoners and guards. Against all odds, Evin would become the only church many of them had ever known. In Captive in Iran, Maryam and Marziyeh recount their 259 days in Evin. It’s an amazing story of unyielding faith-when denying God would have meant freedom. Of incredible support from strangers around the world who fought for the women’s release. And of bringing God’s light into one of the world’s darkest places-giving hope to those who had lost everything, and showing love to those in despair. The book takes readers on a journey into an Iranian prison, giving a haunting description of the horrors and humiliations experienced by women of all ages. Captive in Iran focuses on the personal sufferings of each inmate and shows how the word of God touches them. What struck me was the writers’ steadfast refusal to hate their persecutors, and the love and kindness they showed to their fellow sufferers. Their rejection of persuasions to compromise their Christian beliefs and their patient proselyting among the prisoners and even their captors is much to be commended. The idea that many of the inmates were ready and willing to convert to Christianity but held back for fear of torture and death was an eye-opener. Captive in Iran is a candid account of life in a country where one is not encouraged to speak to God heart-to-heart in one’s own language, where women are beaten and abused by their husbands, and where blood is spilled in the name of God if one converts to Christianity or if one induces another to convert. The book is a factual account of events and is certainly not an entertaining one. Towards the end, I even found the number of characters and their foreign-sounding names rather confusing. I recommend Captive in Iran to all those who desire to know something about the treatment of Christians in countries like Iran, and anyone who is enthused with missionary fervour for the conversion of souls to Christ.